The little ones aren't the only students going back to school. When we hear the phrase "back-to-school," most of us think of younger kids preparing for the first day. Part of that is because most of the commercials and ads are geared towards the little ones, offering everything from cute little book-bags to notebooks with their favorite cartoon characters on them. But not a lot of back-to-school commercials are geared towards the college crowd. Hey, don't they have to go back to school too? Don't they need stuff? Of course they do, so to help them we picked out a few cool items for the dorm room that should make the place more comfy and not hurt the wallet too much. 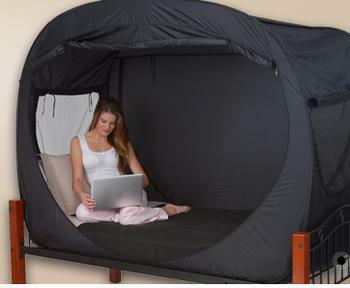 In fact, the most expensive item on this list is the Privacy Pop at $129.99, which is a tent made for a bed so you can get some privacy when you need it. The Privacy Pop fits over most twin beds and zips on either side so you can have a little alone time from your roommate, even if his bed is just a few feet away. The makers say it's quite roomy and you'll have plenty of space to move around once the doors are closed. And it has mesh windows so air can flow through easily. The canopy-like structure shouldn't take up too much space when you're not using it because it folds flat and fits into a carrying bag that you can take with you when you need it. Let's face it: Roommates can get on each other's nerves -- especially in extra close quarters, so if at least one person is able to place this tent on his bed, roomies may able to avoid a lot of arguments and stay out of each other's hair. 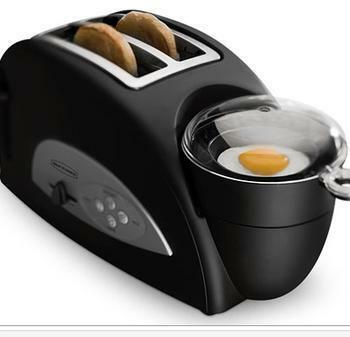 Then there's the Back to Basics Egg-and-Muffin 2 Slice Toaster and Egg Poacher, a product with a very big name but a pretty small pricetag: only $34 at Walmart. It's perfect for the college student who has an early class and can't always make it to the dining hall. You simply pop in your bread, place the egg in the poacher and in four minutes, you'll have a tasty egg sandwich. The creators say you can use the egg poacher to heat your bacon or breakfast sausage, too. And probably the best thing about it is it doesn't take up too much space, which is extremely important in a dorm room. Anytime you can combine two appliances in one -- like this item -- you'll be doing yourself and your roommate a favor by not having a bunch of contraptions all over the place. One consumer who bought the combined toaster and poacher said it pretty much did what the creators said it would do. "I have only had this lovely toaster for a brief time, but I am very pleased. It does everything as advertised and it does well," wrote the consumer. "I already have a great Black & Decker toaster-broiler that I continue to use. I consider this item in a different class. They have different strengths." This next product maybe isn't as eye catching or unique as the others, but it'll come in just as handy. At $15.49 on Target's website, the Folding Tabletop Ironing Board is another of those items that'll save you a good amount of space. You won't need to bother yourself with unfolding those squeaky ironing board legs, because it fits on any table or flat surface, so you can iron to your heart's content -- without taking up a lot of space or getting in your roommate's way. 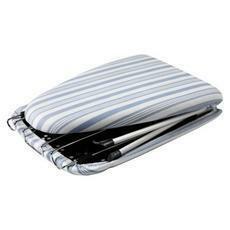 Best of all, it folds up to a very small size, so you can slip it under your bed or stick it in your closet. One reviewer complained about the board being a little flimsy, but said it was still worth the low price. "This lightweight ironing board does everything it needs to do without taking up much space in my apartment," the reviewer wrote. "It may not have a super sturdy build, but it certainly does the job. The iron holder on the side is helpful in keeping the hot iron away from your tabletop or hands, and the striped pattern is cute. Overall, a good purchase for the money." But what if your bed isn't raised enough to put things like the folding ironing board under it? If that's the case, you'll need something called the Power Bed Rise, sold at Bed Bath & Beyond for about $25. The Bed Rise comes in a set of four and you can place each leg of the bed inside it, and raise your bed about 7 inches off the floor. 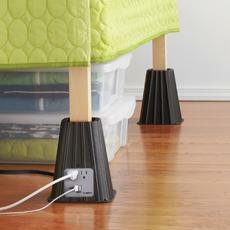 Plus, one riser has a built in power outlet, so you can plug in your devices or a nearby lamp. And the extra floor space will let you store more stuff under your bed, saving dorm room space and making you and your roommate a lot more comfortable.